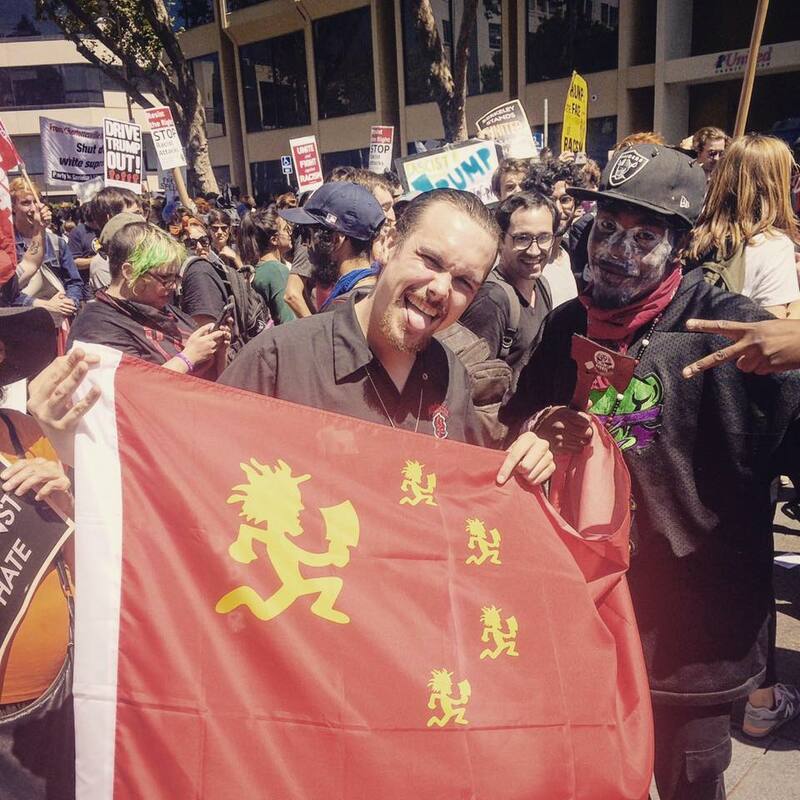 For some it is considered the most unexpected political alliance of the year; the Juggalo youth subculture and organised socialism. First there was the Juggalo March on Washington in protest of being designated an organised criminal ‘gang’ by the FBI at the same time the Trump supporters organised their Mother of All Rallies. 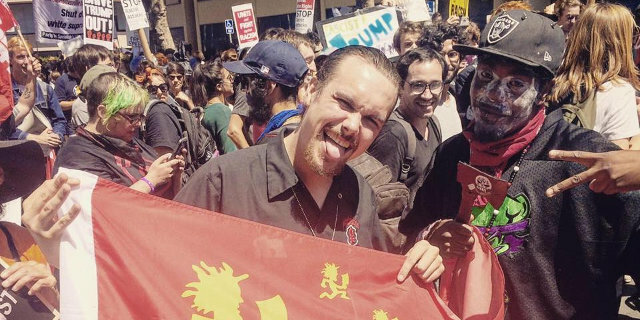 The Juggalos and their allies outnumbered the Trumpers five to one. And the Democratic Socialists were there to help out and support the Juggalo cause. 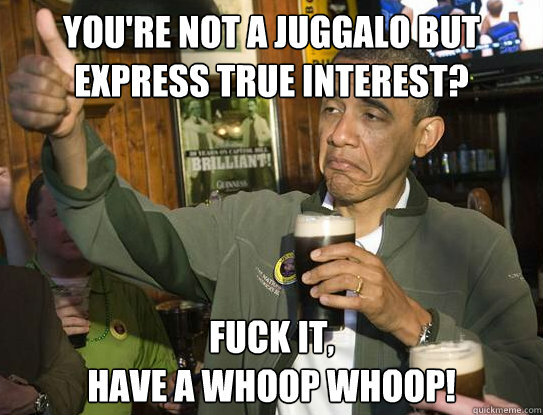 The Juggalo forums reacted positively, and unsurprisingly. In the past Insane Clown Posse have made the opinions on racial supremacism quite obvious, and burning a Confederate flag on-stage in 1993 was just the start. It was about twenty odd years ago that I read an interview with Insane Clown Posse in NME (Insane Clown Posse: Greasepaint’s The Word, interview by Johnny Cigarettes, New Musical Express, May 1998). At that stage I knew of them, but didn’t know much about them. What was particularly striking in the interview was not their sideshow-horror presentation, but their sensible and erudite responses to the various questions. Rather like Marilyn Manson, the presentation designed to shock normal sensibilities was a veneer to some carefully considered views – by which one can compare with Alice Cooper, who views were decidedly either undeveloped or all over the place. Years went on, and my superficial opinion of ICP didn’t change. I had listened to Riddlebox and The Great Milenko and decided that whilst I could appreciate the horrorcore hip-hop style with its carnivale motif, it really wasn’t my preferred style of music or the lyrical content for that matter. Indeed, from my perspective, their samples were far more interesting that their music. Still, as an aging latter-day goth-punk, who would I be to condemn a horror-core subculture, in appearance and sound? They had their reasons which I suspected had some correlation why my reasons. Over time the band generated a not-insignificant following. They had established their own label, ‘Psychopathic Records’, and over the years have signed up some fifty artists, including Vanilla Ice which was not an insignificant coup for them. As if often the case with such independent labels, vaguely defined, the musical style of the associated artists were similar and in this case they were able to generate their own subculture, with their own cultural norms, expressions, and activities. The most significant event was annual Gathering of the Juggalos which has had up to 20,000 attendees. But here’s the rub: The Juggalos are not just a fashion or music based subculture. They are an avowedly working and welfare class subculture, born with stylistic considerations explicitly for those who don’t have money. Cheap clothes from rummage sales, cheap soda and food, people who did not have the financial support to do well in school, who have ended in menial jobs, and who have found “a family” (as they themselves describe it) that will look after each other. People in such a situation either turn on those who are superficially different to themselves as a reaction to their dispossession (typically race, religion, ethnicity) or they seek unity across those boundaries. Unity is however difficult when the superficial differences in phenotype, spiritual beliefs, or origins are usually the first things that people notice. But such things quickly slip away when the first thing a person notices is a strong subcultural presentation – what does race, religion, or ethnicity matter to a Juggalo when they meet another Juggalo? “They’re a Clown like me!” is the stronger reaction. If you spend even a few seconds thinking about it of course clowns are anti-racist. Indeed, not just the Juggalos, but there in an entire international movement of clowns against fascism.